CHARLOTTE, N.C., Dec. 5, 2018 /PRNewswire/ -- Belk surprised more than 200 Laurinburg, N.C. residents affected by Hurricane Florence with a holiday party and gifts totaling $50,000 on Tuesday, December 4. The southern retailer hopes to ease the stress of the holiday season after the storm left the Laurinburg community with a long road to recovery. 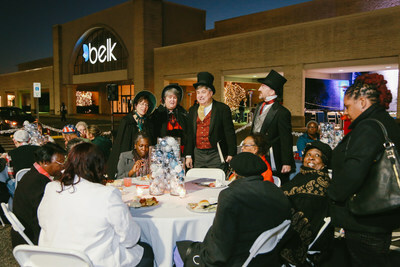 Belk Laurinburg store associates believed they were attending a company holiday party and were encouraged to invite one neighbor and their family to experience the festivities. The retailer helped local families complete their shopping lists by surprising attendees with a $300 Belk gift card, while children in attendance received toys and a chance to share their wish lists with Santa. The event also featured holiday-themed refreshments, an ornament crafting station, a snow machine and more. "We're honored to carry on Belk's legacy of service and community partnership, and now that Hurricane Florence is gone, we wanted bring the holiday spirit to life here in Laurinburg," said Christina Breakiron, Belk Laurinburg store manager. "It's been so inspiring to see everyone in this community wrap their arms around one another." 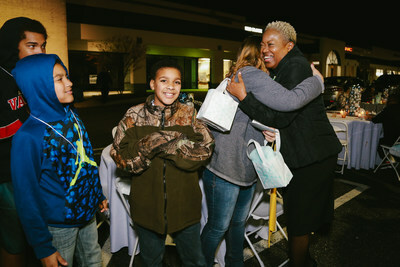 The surprise event is part of a new outreach program, Belk: Project Hometown – the retailer's commitment to strengthen southern communities and help families thrive. Through Project Hometown, Belk hopes to raise awareness for communities like Laurinburg and bring relief to those who lost so much in the wake of the historic storm. Belk, Inc., a private department store company based in Charlotte, N.C., is where Southern customers shop for their Saturday night outfit, the perfect Sunday dress, and where family and community matter most. But Belk is more than shopping – it's where you find your own unique way to express who you are. It's where Southern style lives. Shop Belk in 16 Southern states and on www.belk.com to find an assortment of national brands and private-label fashion, shoes and accessories for the entire family, along with top-name cosmetics, a wedding registry and Southern style for the home. Check out the Belk Newsroom to see the retailer in action as they give back to the community, deliver fashion-forward trends and more.